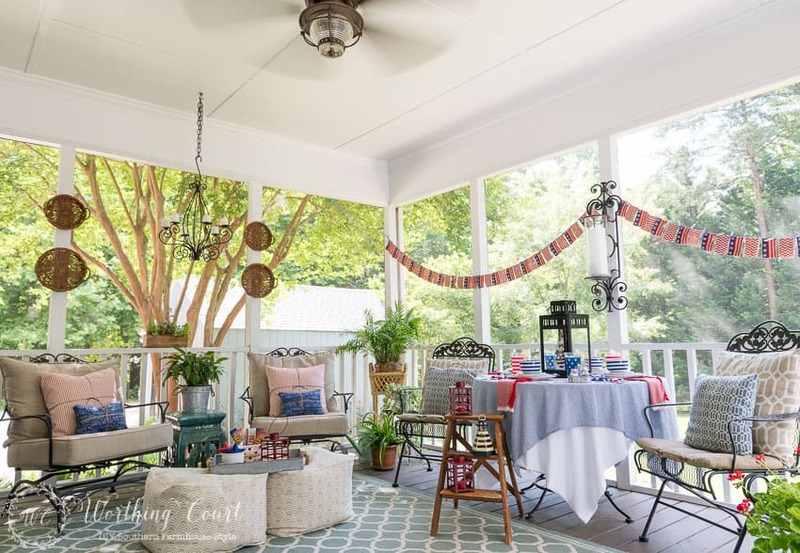 The first spot that I worked on is the side of the porch holding my chairs (with chalk-painted cushions) and the small chest that is actually the bottom half of my mother-in-law’s kitchen buffet. (Check out what I did with the top half HERE). 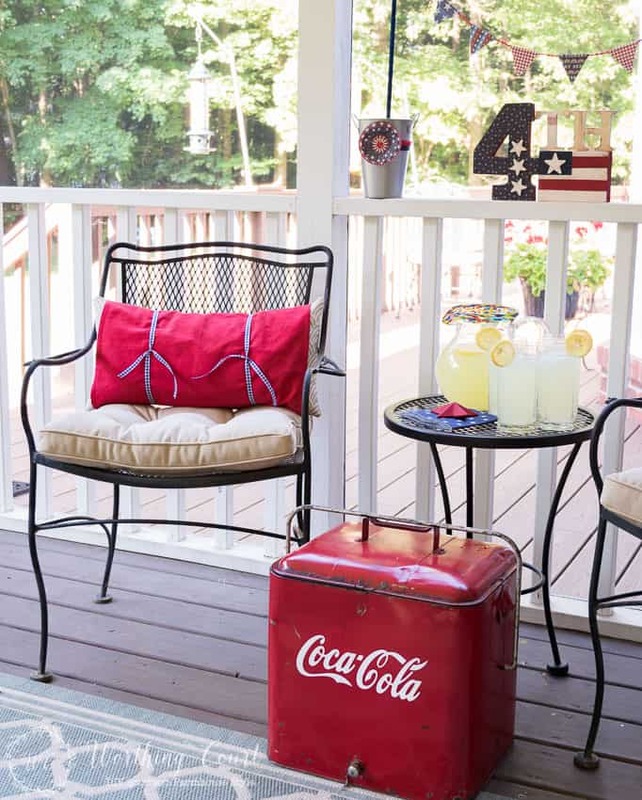 The black lantern came from Ikea, the burlap flag hanging came from Michaels, the painted blocks flag that fills an old Coke crate is one of the crafts that I shared recently and everything else came from my stash. I sure do love using old bifold doors as a backdrop and wish I could run across more. 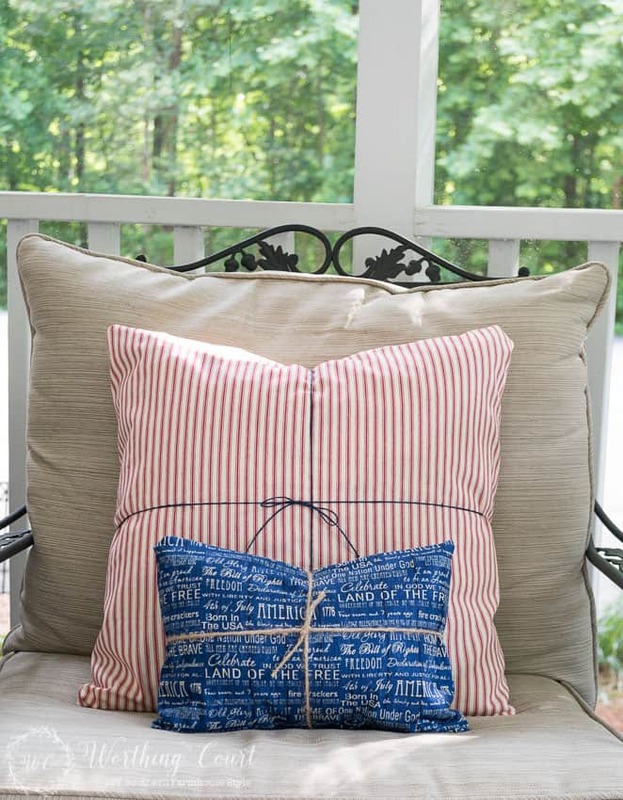 It was super easy to create a couple of patriotic pillows! 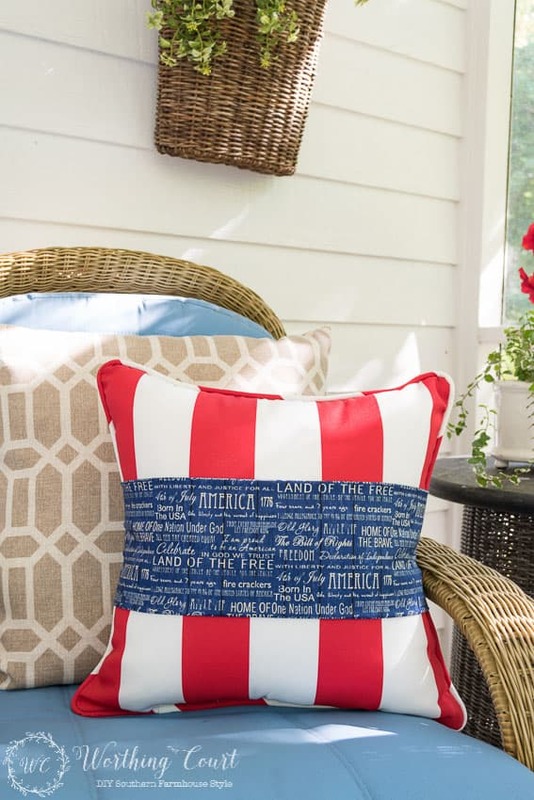 I purchased the red and white pillows (for a great price from HomeGoods) and simply wrapped them with a piece of patriotic fabric that is pinned with safety pins on the back side. The neutral pillows came from At Home. 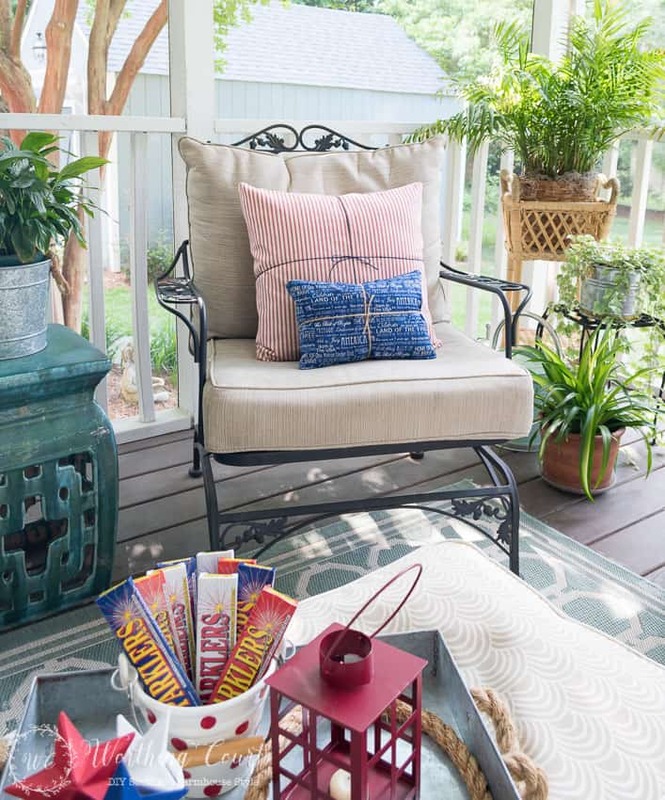 These wrought iron rockers are my fave chairs on the porch – so comfy! A couple of outdoor poufs from Target act as a coffee table, when we aren’t using them to prop our feet up. We’re ready to celebrate with a bucket full of sparklers! 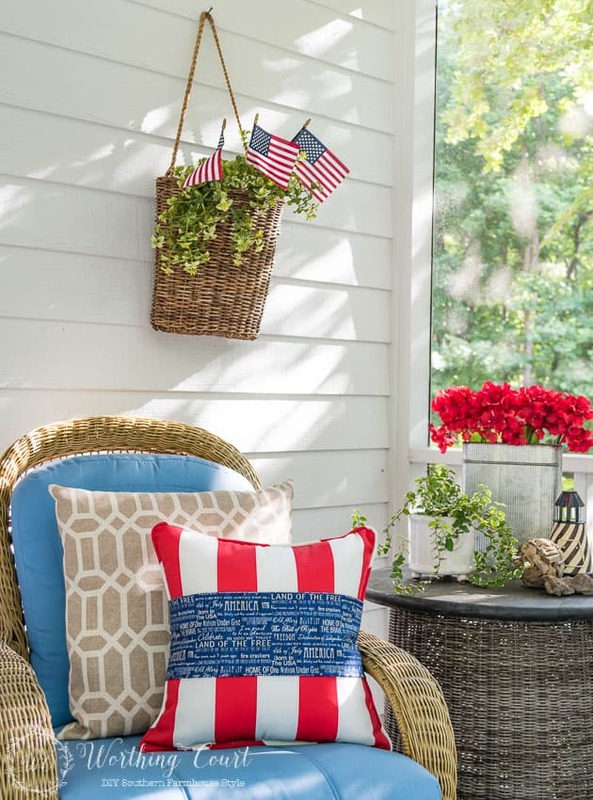 The pillows that normally live in these chairs were wrapped with red and white ticking fabric and with more patriotic fabric, then tied with twine to keep the fabric in place. You’d never know that the smaller pillows are actually covered with snowflakes! Our round table is all set for serving pimento cheese bacon burgers from the grill and for having ice cream for desert! The table is set for four, even though I’ve only used two chairs in the photos. I knew when I made the super-duper easy flag banner garland that this is where I would use it. It’s makes a great backdrop to the setting. Click HERE to see how I made it. Trust me, this banner is easy enough for anyone to make! Let’s see…the black lantern came from Ikea, all of the table linens, dishes and glasses came from HomeGoods (I hit them early in the season!) and everything else is from my stash. Did you notice Uncle Sam hiding out in the lantern? I love, love, love to layer linens and use stacks and stacks of dishes! And how adorable are the wooden ice cream spoons??? 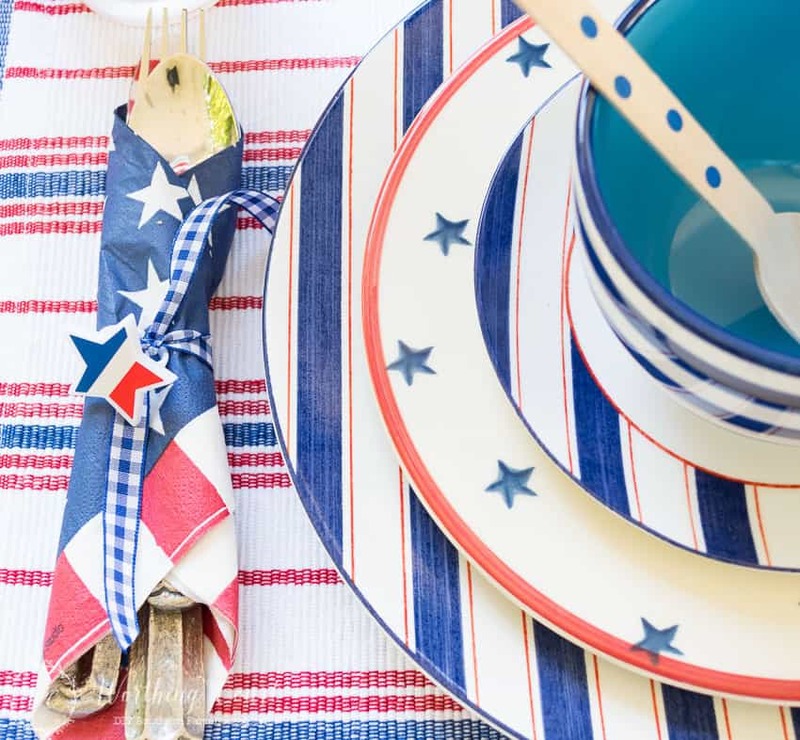 The packets of silverware are wrapped with a patriotic paper napkin and tied with a bit of ribbon. Cute little plastic rings from Dollar Tree are clipped around the ribbon for an extra added bit of detail. I set my vintage wooden stepladder in front of the table to fill in the empty spot where a chair will ultimately go, but it will get moved somewhere else once all four chairs are around the table. I think that the red lanterns came from Target and the little lighthouse candle holder came out of my stash. I added a couple more wrought iron chairs to the side of the porch that looks out over the deck since I first shared my porch with you (click HERE to see the before and after). Nothing fancy, but the extra seating sure does come in handy. Maybe you can see the birds at one of our feeders in the background. We get quite a variety of birds visiting our feeders! The bay windows that you see are where my breakfast nook is and makes a wonderful spot for bird watching. We’re lemonade drinkin’ ready over here! 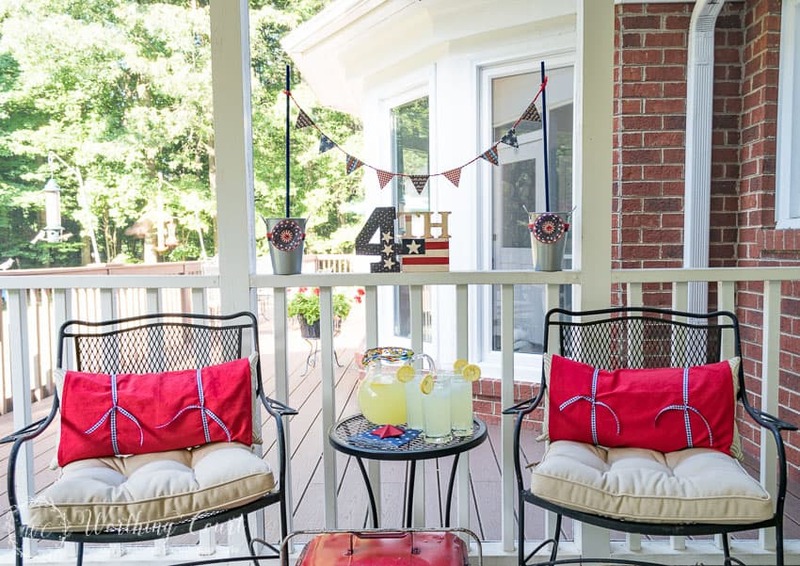 I set my take-apart patriotic craft and a flag banner that I made and used at our previous home on the railing. 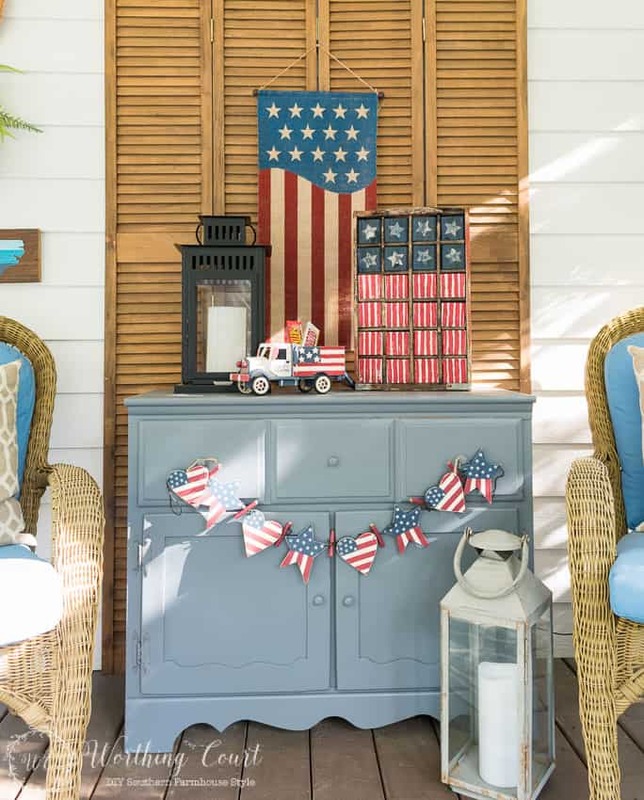 Click HERE to see how to make this fun take-apart craft and click HERE to see the vintage Americana vignette where I originally used the pendant flag banner and buckets. 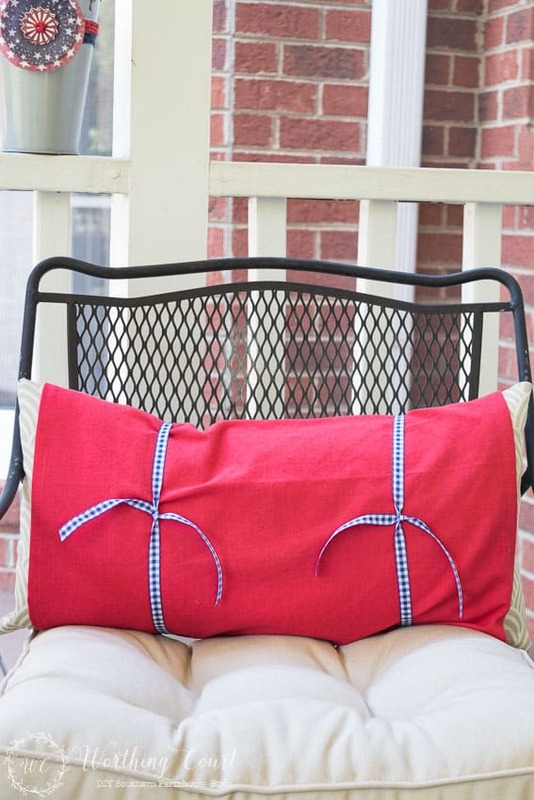 The lumbar pillows in these chairs were wrapped with red napkins and tied with blue and white check ribbon. You can see that the napkins don’t completely cover the ends of the pillows, but they still work fine for a temporary seasonal display. I know this is a lot of photos, but I’ve added a couple more that I snapped with my wide angle lens to give you a better idea of the whole porch layout. Happy July 4th, my friends! Do you have any special plans to celebrate Independence Day? Cute, cute, cute, Suzy! So many fun details! Just add fireworks! Thank you, Lynda! It was fun pulling it all together. Suzy, your porch is delightful. Would enjoy borrowing more of your decorative elements for our own long, narrow porch. 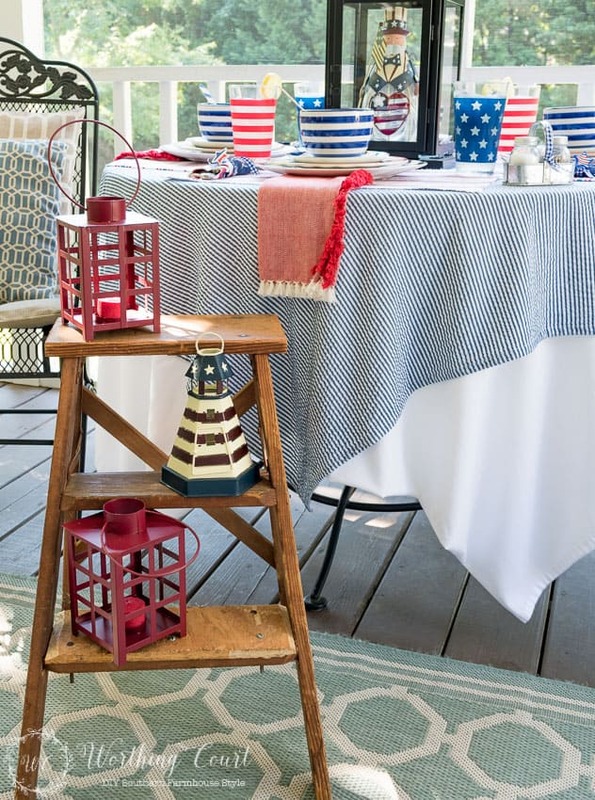 Already have similar metal chairs with taupe cushions, a large flying flag, lantern and potted annuals. All we are in need of is a Home Goods store in closer proximity. Shop there when visiting our daughter and family. As always, thanks for sharing. 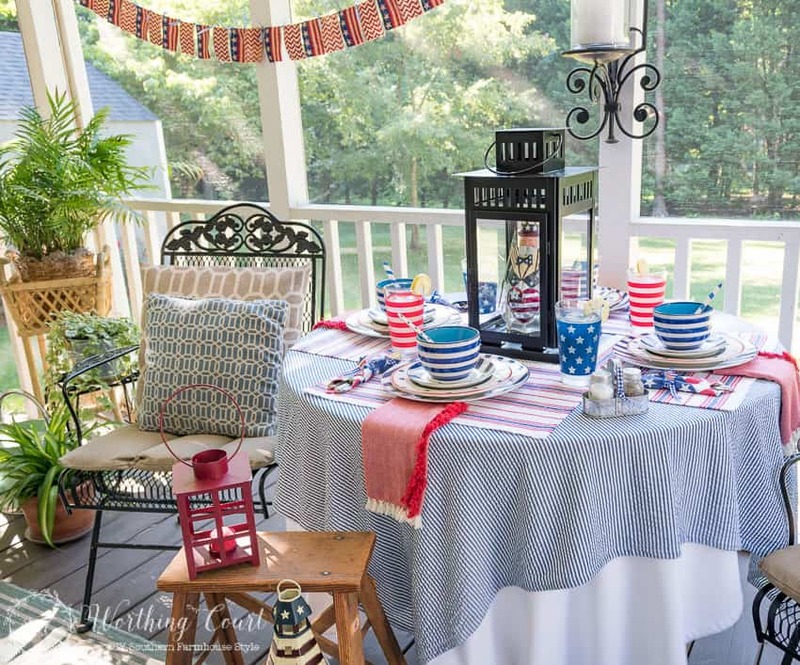 I want to come and spend the 4th on your lovely porch! I love it all! You have really decked it out so nicely. I can’t wait until we have a little larger covered area on our back porch. When it storms hard here in Florida everything on the back porch can get soaked, so I can’t decorate nearly as cute as you have! Of course, there is that adorable garland you made! I still can’t get over how easy that is! I hope we see you at Celebrate Your Story tonight! So glad you like the porch, Chloe! Come on up to NC for a visit and a glass a cold lemonade! 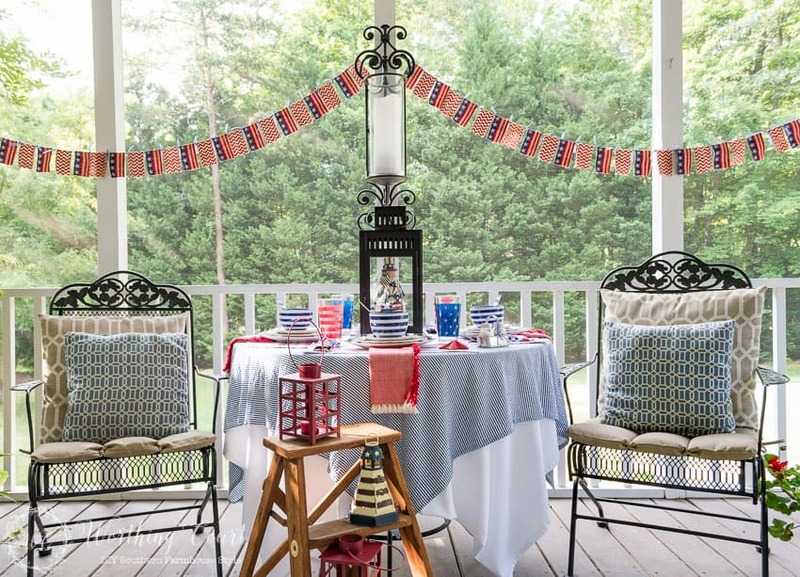 Your patriotic porch decor is fabulous. There are so many great elements to it. Pinning. Thanks for partying with us at Snickerdoodle Sunday. Thank you so much, Beverly! Happy 4th! Happy 4th to you, too, Suzy! 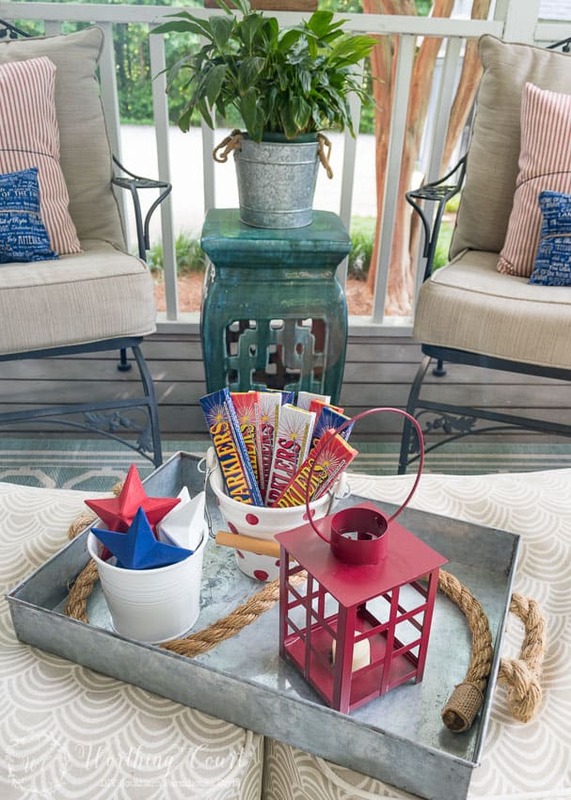 I’m popping back by to let you know I’ll be featuring your lovely patriotic porch at today’s Snickerdoodle Sunday Party. Hope to see you there! wow, amazing job! thanks so much for sharing on craft schooling Sunday! Thank you! I always enjoy your party! Amazing screened in porch. You decorated it beautifully. 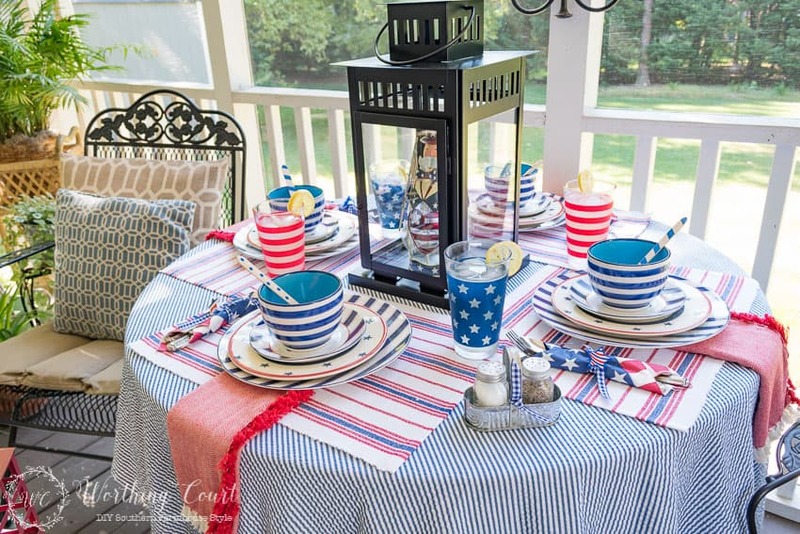 We will be camping the 4th of the July so I don’t need to decorate anything, but I still loved looking! Thank you and Happy 4th, Amy! I love styled porches! I don’t have the neck for it so maybe that is why I love looking at them. I hope that I was able to give you some inspiration, Leslie! 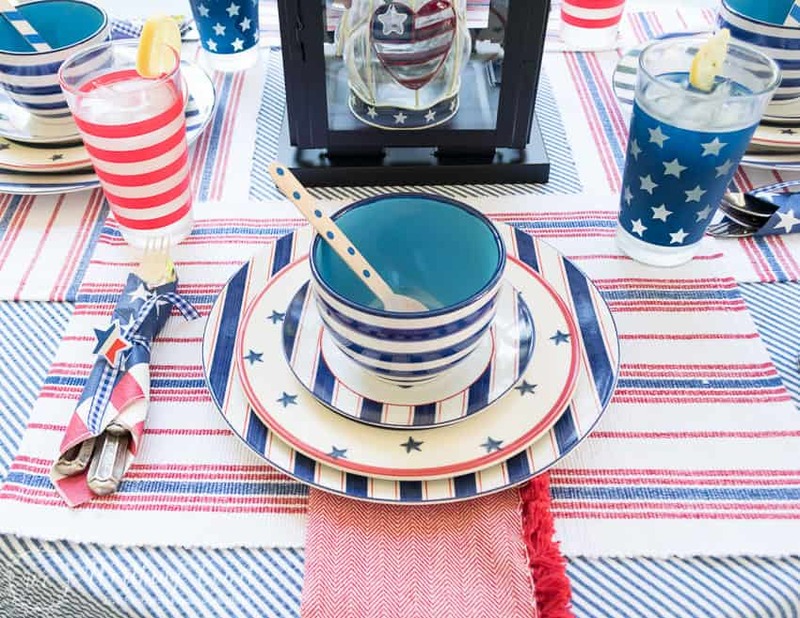 I love all of the patriotic decor! I think it is the perfect balance without being tacky. I especially love the tablescape! Thank you, Mary. I’ve accumulated so much patriotic stuff over the years that it was hard not to get too carried away! Your porch is amazing! Such a fun and festive space! Looks like the perfect place to sit and enjoy a cup of lemonade!!! Thank you, Tammy! Come on over and we’ll enjoy an ice cold glass of lemonade together! 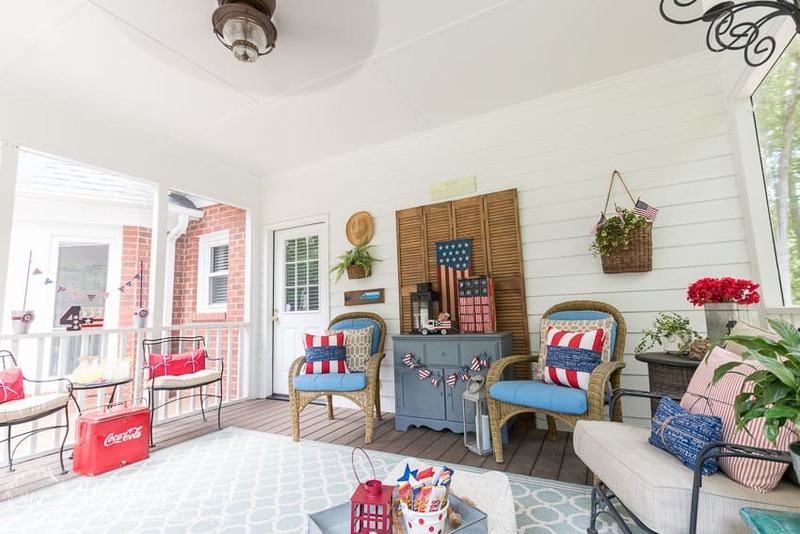 What a beautiful and fun looking porch! Thank you for sharing your creative ideas! I LOVE the block flag and the little Americana truck! Where did you find that little cutie? Your place is so inviting! Happy 4th of July! Amazing porch….I would live out there!!! Thank you, Shirley! We do live out there as much as we can! Very cute and cozy, makes me want to make my porch all decked out for the holidays! Thanks for sharing. So glad that I was able to inspire you, Amanda! 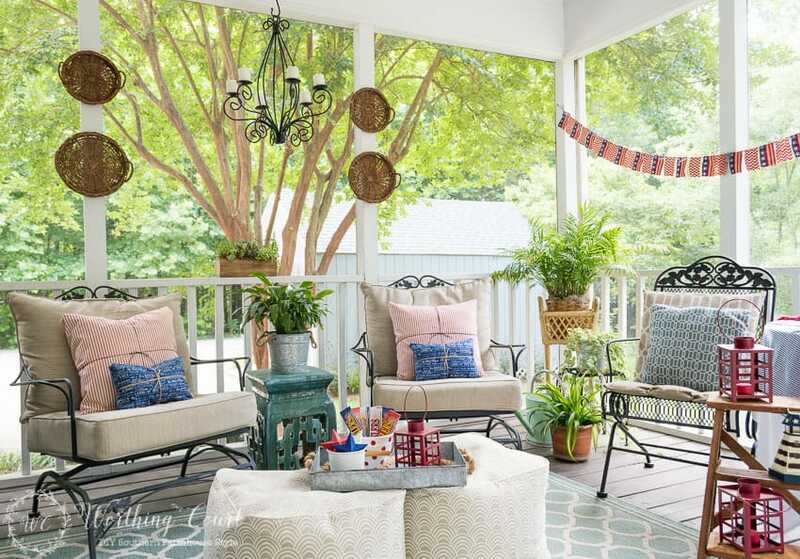 gorgeous porch set up! love what you did here 🙂 thanks for sharing ! Thank you so much, Tianna! Happy 4th! GORGEOUS and amazing! What a festive looking porch! So very well done – you thought of everything. Thank you so much, Jennifer. Happy 4th! Thank you, Janet. I probably had more fun putting the table together than anything else on the porch. Happy 4th! 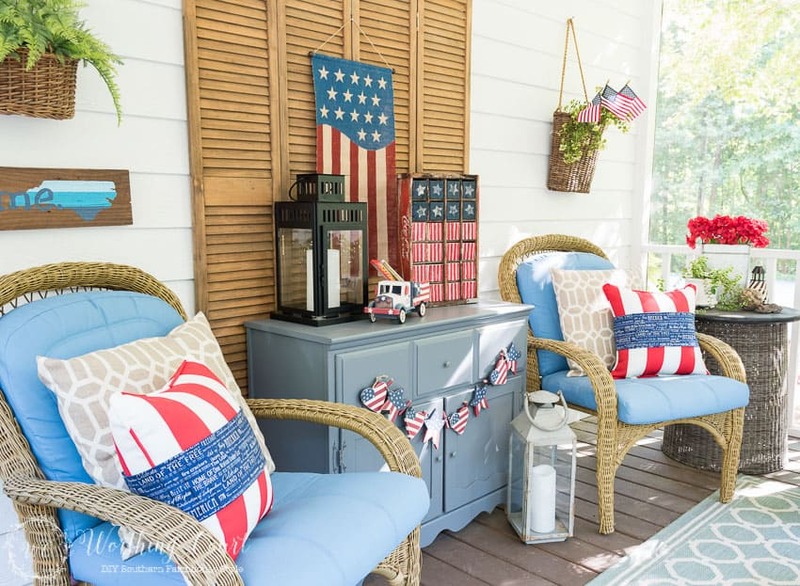 Your patriotic porch looks beautiful!!! I love it!!! You did a wonderful job and thought of every little detail. I hope that you have a very Happy Fourth of July!!! Thank you, Shannon. I hope that you have a wonderful 4th too! Oh my goodness, how adorable! Happy 4th of July! Thank you, Kelly. Happy 4th to you too! So many great ideas and so festive and inviting!! Thanks for sharing with us at Throwback Thursday!